There are times when the appearance of a product is equally as important as the function; if we know that from the outset we will design and manufacture with the visual impact as a priority. To provide a cosmetically presentable component as the interface for a system used by customers in high-end bars and restaurants. The function of the component meant that it needed to be a durable and stylish bottle entry point that looked great and could be delivered to a budget. We are now supplying a part with a great finish to schedule demands and within the necessary cost bracket. Glassbusters manufactures and supplies a unique solution to high-end bars and restaurants for on-site collection and recycling of glass bottles. The system allows customers to dispose of their own bottles at point of use within the establishment; the glass is taken to a central point (usually the basement) where it is fragmented into Eco-sand ready for collection. The top section into which the customer places the glass is a moulded rubber component, which is connected to pipework that drops the bottles down to the central recycling point. Glassbusters came to us looking for the moulded rubber components for their range of glass collectors. Ensuring the product was presentable and aesthetically pleasing was a critical aim as it is situated in visible areas of exclusive bars and clubs. In order to achieve the cosmetic finish required for the publicly visible aspect of the new service, we worked with the customer to arrive at a tool surface finish and material selection that met both their service functionality and aesthetic requirements. 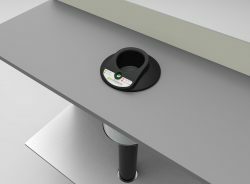 The current product is manufactured in a silicone rubber grade, but future development using a fully recyclable grade of rubber unique to us is being evaluated, as this would complement the recycling ethos of the Glassbusters product. The finished product can be found in select venues throughout the UK.